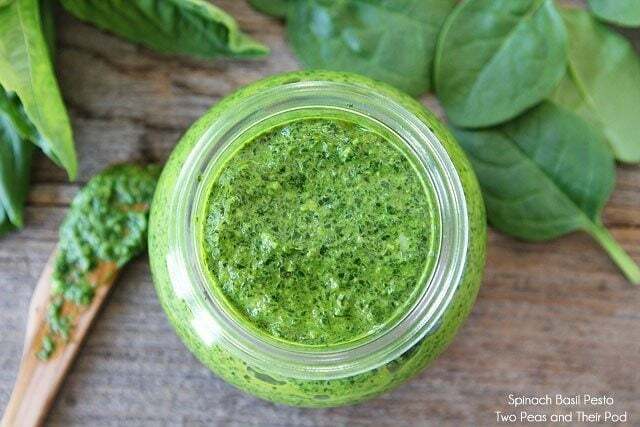 Spinach Basil Pesto – A great flavor booster, we keep a jar of this Basil Pesto in our fridge at all times. Learn how to make pesto in 5 minutes! Basil Pesto goes well with just about everything – pasta, salads, vegetables, chicken, fish, potatoes, soups, pasta, even sandwiches. 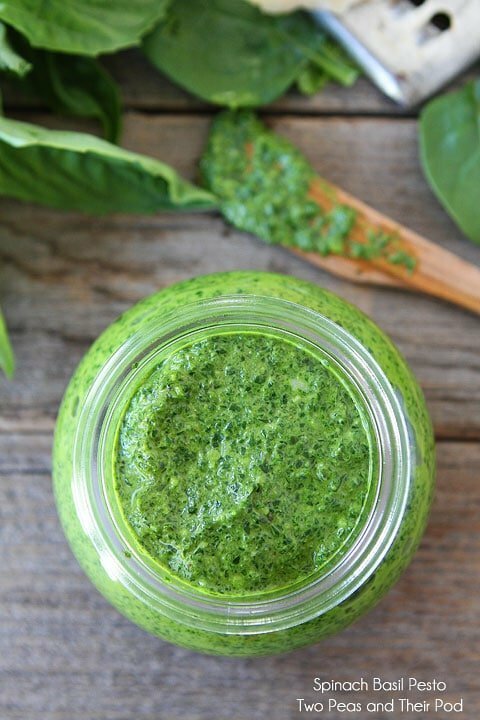 Today, we are sharing a super simple recipe for Spinach Basil Pesto. This nut-free pesto recipe is a summer favorite when the garden basil is out of control. You all need to add it to your must make list. This pesto can be made in 5 minutes and goes well with just about everything-pasta, salads, vegetables, chicken, fish, potatoes, soups, gnocchi, and it’s so good on sandwiches. This easy pesto recipe is our all-time favorite! And if you are hesitant about the spinach, don’t be. Embrace the spinach. You really can’t taste it and it gives the pesto a vibrant green color, which makes me very happy. I love green! Plus, spinach is so good for you. I mean, you’ve seen Popeye flex his guns, right? Don’t you want arms like that? Gotta eat your spinach! Why not in pesto form? Our boys don’t even know this basil pesto is made with spinach and they love it! Plus, spinach is cheaper than buying a ton of basil, so this is a budget friendly pesto too! If you need the pesto to be vegan or dairy-free you can leave out the Parmesan cheese, it is still good without it! We keep a jar of Spinach Basil Pesto in our fridge at all times. Again, it has so many uses. I am always incorporating basil pesto into our meals. It is such a great flavor booster. In the summer, when our basil is growing like weeds, we make a huge batch of Spinach Basil Pesto and put it in the freezer. It comes in handy during the winter months. Pro tip, freeze the pesto in ice cube trays! A little pesto goes a long way and the little ice cubes of pesto are perfect. 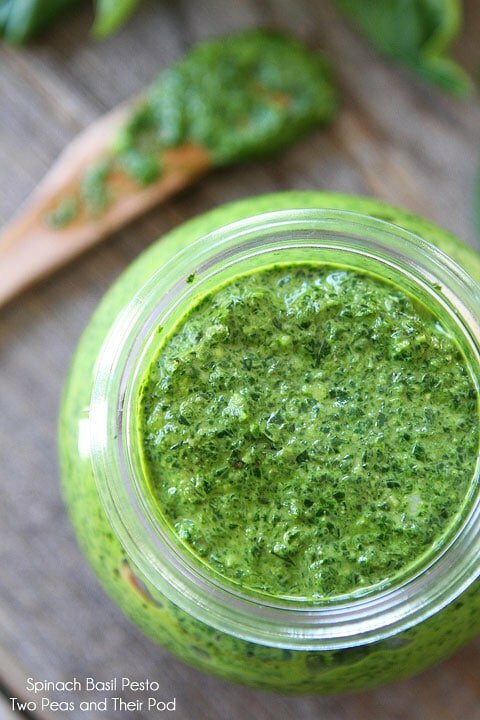 Make a batch of Spinach Basil Pesto today! And come back on Wednesday because we are going to share a killer recipe that involves this presto pesto! See, I told you it has so many uses and you don’t want to miss this one! 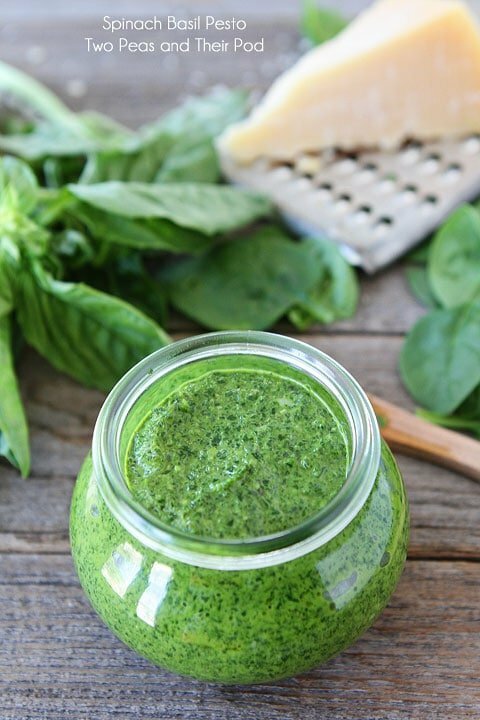 This nut-free spinach basil pesto is bright green and full of flavor! It is great with pasta, veggies, chicken, fish, or as a spread on sandwiches. Place the olive oil, spinach, basil, garlic, garlic, lemon juice, parmesan cheese, salt, and pepper in a food processor or blender. Turn on the machine and blend for 30 seconds. Stop and scrape with a spatula and blend again until smooth. Taste and add more salt and pepper, if necessary. Note-if you like a thinner pesto you can add a little more olive oil. I love the idea of a nut free version! I totally want to give this a go. I wonder if sunflower seeds could be a good nut fill in too? I’m allergic to nuts and this looks awesome! I will have to try this. Thanks so much for this fabulous recipe! I love pesto! Your photos are beautiful! I love the color of the pesto!! I love trying new pestos and this looks awesome! do you think it would be possible to replace the spinach with kale? I love that bright green color and anything with loads of basil and cheese you can count me in on! We have loads of spinach and basil for our customers right now. I can’t wait to share this recipe with them! Love the color and disguising spinach with basil and parm sounds pretty wonderful to me! Thanks for the nice recipe for pesto. Have a great week. What an amazing vibrant green colour! Spinach goes really well in pesto! we always have spinach on hand so this is perfect! would love it as a sandwich spread! Love love love this idea! Makes it a little lighter too. Feel like I can almost smell the basil in that photo! I’m just gonna open my mouth and let you smear this all in it. This recipe would taste great with Pesto Straws! They are so good!!! Try making them! My mom and I just made spinach basil pesto on Saturday! Ours was nut-free today, but we added in cannellini beans for fiber & protein. Sometimes when I want my pesto more saucy, I add in a bit of reserved pasta water. Love how versatile pesto is! I love how green it is!! This would be perfect on EVERYTHING. I love pesto! I can’t get enough of pesto this time of year! Just made 2 different varieties last night! This is absolutely gorgeous – that color! Love spinach pesto ~ such a nice twist on the classic recipe. love that vibrant color and I am sure it is wonderful on just about everything! I need to action this pesto immediately! It would spruce up any weeknight meal in 2.2 seconds! My husband isn’t really into nuts much so the pesto nut taste has always been off putting to him. But this recipe might just do the trick. Thanks! What a fabulous nut-free version! I can’t get over that bright green color. I love the addition of spinach for an extra veggie punch! I love your blend of spinach and basil, it gives the pesto such a brilliant color! Pesto is one of my favorite things on the planet. This is a great way to get extra vitamins, too! This may be the easiest pesto I’ll ever make. Thanks, Maria! I pretty much never use pesto because I have nut allergies. I don’t even really know HOW to use pesto – but I’m excited to see what you’re doing with it this week. Thanks!!! Woo finally! Thanks so much for a nut free version, I’ve wanted to try pesto for ages, but I haven’t been able to as I’m allergic to nuts! I have a teen with a tree nut allergy, but I love pesto. This sounds like a great alternative for all of us. Thanks for sharing! I’ve never seen a prettier pesto. 🙂 I must make it! This pesto looks so divine! My CSA farm share frequently floods my kitchen with spinach, and I thought I’d become talented at all the different places I can stuff spinach into (my favorites are pizza dough and smoothies), but I’ve never considered making a spinach pesto. I bet a spinach pizza crust, topped with spinach pesto sauce, would be an excellent combo. I’m going to have to make this. I’ve always shied away from making my own pesto because the pine nuts are so expensive. I never even thought about making pesto with it! How awesome that this is nut-free! I can see myself slathering it all over grilled meats and mixing it into salads as a dressing. Love it! I use sunflower seeds in my pesto because my nephews have nut allergies. They work great…if you as me! No one has figured it out so far! Love-love-love spinach pesto! This looks incredible, Maria!!!! Pesto is so great on so many things, I need to try this spinach version! Looks so good! What a great idea! Super smart!! We love pesto around here and should have some baby spinach coming up in the garden soon. Thanks,Maria! How fab is this! My sister can not eat nuts or seeds so this is perfect for her. I swear this would go great with some blue cheese too. I like the vibrant color and the texture it has, it look samazing! I am sure it goes well with a grilled chicken breast. Love the vibrant green color! I love spinach pesto even better then the original. I’ll be making this along with your spinach artichoke pesto pizza! I love using seasonal ingredients. How do you freeze it? In bags? You can freeze it in freezer bags, tupperware, or even ice cube trays! This was so yummy! My 2 yr old helper and I made this for dinner tonight and also tossed in some spring onions and a few sliced almonds we had kicking around. So delicious! I made this pesto last night – so easy, and fantastic flavor! Can’t wait to use it on dinner tonight! Thanks, Maria. Looking forward to meeting you at BlogHer next week! I made this recipe and it is FABULOUS. I used a high quality olive oil and OMG it is so good. 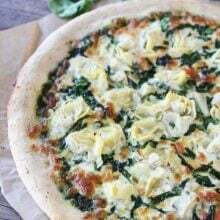 We also made the artichoke pizza and it rivals the product any gourmet pizza shop. It may have been the best pizza I have ever made so far. Seriously good. I will make this pesto recipe again and again. This pesto is as good as one made with pine nuts. We spread it on slivers of steak. Out of this world. Is there any non dairy substitute for the parmasean cheese? Would it be okay to leave it out? I can’t eat any dairy but this presto recipe sounds delicious! You can leave the cheese out if you can’t have dairy. Do you pack the spinach and basil leaves to measure? LOVED this pesto recipe. So glad to have a nut-free pesto. Thanks! Made this the other night and it’s SO GREAT! I added a dollop of Greek yogurt which I definitely don’t regret! Been using this on everything for days, I love it so much! Thank you for this recipe. I substituted the parmesan for goats cheese, my little one is dairy intolerant, and realised I didn’t have enough spinach, but still turned out perfectly! Do you use the stalks of the basil as well as the leaves? Looking forward to trying your zucchini chocolate cupcakes. I just use the leaves. Glad you liked it! spinach in for extra veggie punch. Superb article. I’m checking out constantly this site for inspired! Useful information and facts precisely one more aspect 🙂 I deal with such info considerably. I used to be trying to find that info for any pretty lengthy moment. Thank you and with good fortune. Love the use of lemon– basil pesto can turn brown fast …. look forward to making it with spinach too. And allergies to nuts …. pine nuts are not really nuts so people may not be allergic to them as they are regular nuts. Thanks for sharing this! I made it today and it was a huge hit with my family, even my picky mom! My little sister is allergic to all nuts, so it was great to have a homemade pesto that tastes just like the ones I’ve had at restaurants. i substituted nutritional yeast for the parm cheese for a vegan version and it is awesome, thanks ! Sunflower seeds are a great additon – cheaper than nuts & no worries about allergies. Delicious! We have dairy allergies in our house as well as nut, so we substitute nutritional yeast (such as Bragg) for the pram cheese, and you seriously cannot tell the difference! I made this and used for a pizza sauce. I used vegan parmesan and vegan cheese on the pizza and it was delicious! Thanks for this great recipe. This is so good! My daughter and I absolutely love it! Thank you! She has a tree nut allergy so your recipe is so helpful!!! thanks for this great recipe, I’ve always wanted to try pesto but have a nut allergy. Onto my second batch and I think this will be a staple in my fridge now! thanks again for the recipe! I made this pesto but made the mistake of using Kosher salt. It was wayyyy to salty. Do you recommend sea salt? You can use either and you can reduce to your liking of saltiness! Thanks for this recipe. But can canned spiach be used in this recipe . I have only used fresh spinach. How can I make this for 50 people or more? My daughter graduates next year and this sounds great. Looks good! How necessary is the cheese? This was AMAZINGLY delicious! Even my kids loved. I’m making it again tonight to share with our church small group. Great recipe! Loved on the pizza. And the pesto freezes perfectly! Have some in stock in our freezer now! Can you use chia seeds or flax seeds instead of nuts? This recipe doesn’t have nuts. I made this today and it was so, so yummy and easy. Thank for the recipe – Tried it this week and it’s delicious! I am so glad I found this! I love pesto. I miss pesto! My child is severely allergic to tree nuts (and peanuts). I am making pesto this weekend! Thank you! What a fantastic “Pesto.” We have a nut-free home due to allergies and Pesto was something I thought I would never taste again. 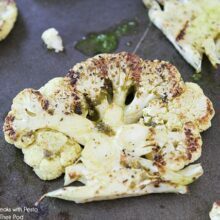 This recipe hit the mark and I much prefer it over pine nut or walnut versions. We had it as a spread for a chicken/tomato/mozz/bacon/avocado sandwich. It was the star of the meal. Those e is a keeper. Glad you like the pesto! Made this tonight and love it! Will be making more to freeze. Thank you so much for this recipe! Yay! Glad you found this recipe! We love it! Any tips for freezing? do you add oil to the top? Does the pesto turn brownish in the freezer? Thanks in advance! I don’t add oil to the top. It turns a little brownish, but not much. It freezes great! This recipe looks delicious! 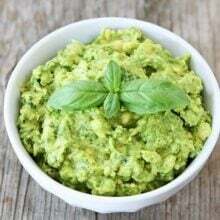 I’ve always been allergic to nuts, so I’ve never been able to try pesto before (and my best friend is obsessed with it, so she talks about it all the time ) I’m also allergic to dairy, so I was wondering if there was anything I could use to substitute the Parmesan? Thanks! Wondering if the basil and spinach is packed or loose? I made this tonight to enjoy with my daughter who has a nut allergy. It was delicious and beautiful… and it was great to have a pesto we knew was completely nut free. I have a question. . When it comes to 2 cups of basil, does that include stems, or just leaves? Is it possible to make this without the cheese? Wow! Delicious! I bought a basil plant for another recipe and thought I’d try making pesto with the leftovers but nut-free because I am allergic. This turned out great! I think I may add a little more olive oil upon serving but for now the pesto is in the fridge, flavors melding, and getting even better! I taste tested it with some bread and wow, delish! Thank you! Wonderful recipe. My daughter is allergic to nuts so I was searching around for alternatives and tried this and it was so so good – winning us all over. Tangy and delicious. YUM! What do you put the pesto in to freeze? I think I might need to get some small freezer containers. I am at least going to make a small batch. I like to do ice cube trays. Just whipped this up and it was DELICIOUS. Thank you! Hey Maria, first of all, I love the name of your blog – Two peas and their pod 🙂 really make sense. And I love this pesto sauce recipe, as mostly I make pesto sauce with basil and never added spinach and at times it becomes bitter. so I will give a try to this recipe. This recipe is a life saver! Put it on anything, pasta, sandwich, potato … and you’ll have a delicious dinner in no time. Thanks. My family said it was the best pesto they’ve ever had. I’ve never used spinach before. I made it exactly as written. The only tweek I mad was to decrease the salt bcz spinach and Parmesan tends to be salty m.
I’ve never left comments for recipes before but I think you deserve it. Making this for the 20th time because my kids love it and ask for it. But the reason why it’s so special is because they are allergic to nuts and also don’t love spinach but this somehow works. 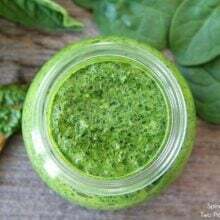 I tried the Spinach Basil Pesto recipe and my family absolutely LOVED it, it was definitely a WINNER in my house!!!! Do you ever use nutritional yeast? We have a nut and dairy allergy in our family and I am just wondering if subbing nutritional yeast for the parmesan would be a one for one sub or less? I dont put it in and it still tastes fantastic. Such an easy recipe to follow. My son is allergic to nuts so this recipe was just perfect for us to make so many different things such as pasta and pesto tarts. I work in a daycare making food for about sixty kids. Nuts are banned from the daycare so finding a great pesto was kind of difficult. every time I make this recipe with pasta, they devour it. it is one of their favourites. Just made this this morning with the copious amount of basil my wee container garden is producing. So easy! And really good. I chose this recipe because it didn’t require me to go on a hunt for pine nuts, but think it might become my go-to. Pesto is ALWAYS necessary to have in the fridge! I love the recipe. I tried it tonight and it was a big hit. I would definitely make this again. It came out great . My new favorite recipe. I like pesto but I haven’t been a big fan. This recipe completely changed it. The pesto tastes very fresh and I love the color and consistency. We always have it in the fridge and our family -incl. teenage kids- often make themselves a toast/sandwich with it, or we have it on pasta for a quick dinner. Whichever way – it tastes fabulous! I only blend mine briefly so I get a rougher consistency and a tiny bit of crunch to it. But that’s just my preference. This was my first time ever making pesto and it was absolutely incredible. I ate it over lentil spaghetti with tomatoes and grilled chicken. The only thing missing was some fresh mozzarella!